Urbanization and industrialization are the two leading factors responsible for driving the global defoamers market. This is mainly due to a crucial role played by these products owing to their ability to prevent foaming in various industrial processes. With widespread advancements expected to occur in several industrial domains, this market is predicted depict an impressive growth from an overall perspective. According to expert analysts, the global defoamers market is expected to surge ahead at a healthy CAGR of 4.50% during the forecast period from 2017 and 2025. With this growth, the market is projected to gain revenue worth US$7.35 bn by 2025, which is a decent increase from a previous valuation of US$2.73 bn achieved in 2016. The global defoamers market is mainly segregated into various segments based on product type and end users. Under product type, oil-based, water-based, silicone-based, and others, are key segments. From the perspective of end users, the market comprises an assortment of segments such as paper & pulp, water treatment, paints & coatings, food & beverage, oil & gas, agrochemicals, pharmaceuticals, chemical, metal working, and others. Of all the varieties present under product type, silicone-based defoamers are utilized the most in myriad applications. Pharmaceutical, petroleum processing, construction, and manufacturing of paints and coatings, are some of the key sectors where silicone-based defomers are extensively used. Thus, this segment fetches topmost revenue in the global defoamers market, thereby holding a leading position. However, there are several environmental concerns regarding use of silicone-based defoamers, thus putting the onus on water-based and oil-based materials. Owing to strict norms imposed by many governments against silicone-based defoamers, water-based and oil-based defoamer varieties are expected to fetch splendid revenue in future. 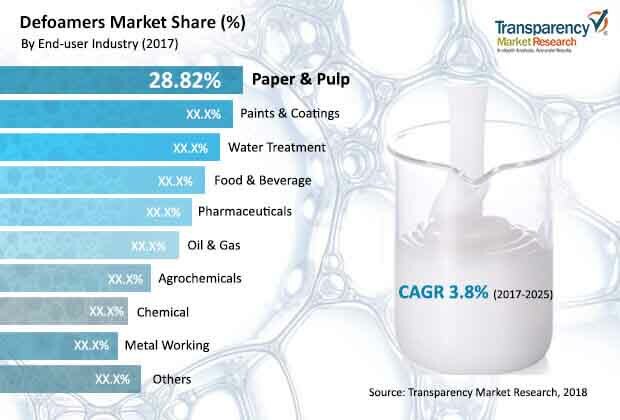 Taking the end users into consideration, maximum demand for defoamers exists in the water treatment, paper and pulp, and the paints and coatings industries. Such a high demand makes these segments lead the market in terms of revenue generated. In 2017, the paper and pulp end-user industry ranked higher in terms of market share by achieving a 28.82% share in the same year. Defoamers are also used substantially in the food and beverages industry, thus existing as a second-placed segment in terms of adoption. However, demand for defoamers in paints & coatings as well as metalworking sectors is predicted to highly increase during the forecast period. Owing to a shift in decorative paints, the paints & coatings segment could dominate the global defoamers market in the near future. Whereas, an increasing demand for innovative metal products is expected to fuel use of defoamers in the metalworking segment, further driven by a surge in extensive research and development carried out by key market players. Geography-wise, the global defoamers market is spread across North America, Asia Pacific, the Middle East and Africa, Europe, and Latin America. Of these, Europe and North America depict maximum production of defoamers as well as utilization of the compounds, compared to other regions. This is mainly due to burgeoning industries that involve activities such as construction, water treatment, architectural work, and many other small-scale sectors. Tremendous growth opportunities lie in these regions owing to the presence of topnotch defoamer manufacturing companies in these regions. However, rising urbanization in emerging economies could make Asia Pacific take a leading position in the market by expanding at a steady 4.3% CAGR. DyStar Group, Wacker Chemie AG, DuPont, Kemira Oyj, BASF S.E., PMC Group, and Solvay S.A., and Clariant AG, are key players operating in the global defoamers market. Defoamers, or antifoaming agents, are chemical additives that reduce and hamper the formation of foam in industrial processes. Defoamers are generally insoluble in the foaming medium and possess surface active properties. They offer low viscosity and spread rapidly on the foamy surface. This is an essential characteristic of defoamers. Defoamers have an affinity toward air-liquid surfaces, where they threaten the foam lamellas. This results in the rupture of air bubbles and breakdown of the surface foam. Defoamers play a crucial role in pulp and paper mills, as they help lower the problem of foam. Defoamers also hamper the formation of foam. They are surface active agents such as esters or amides of fatty acids and PE glycols. Various types of issues occur due to the build-up of foam in paper mills. These include difficulties in formation of paper, creation of deposits, development of bacteria, and drainage problems. Furthermore, the effectiveness of pump is also hampered. Defoamers improve drainage in kraft pulp stock and sulfite stock in pulp mills. Usage of defoamers leads to reduced paper breaking, thus improving paper machine operation effectiveness. Defoamers facilitate lower steam consumption. This helps save energy and costs. These properties are anticipated to drive the defoamers market. Demand for defoamers is currently high in water treatment and food & beverages segments. However, the demand for defoamers in paints & coatings and metalworking fluids segments is expected to rise significantly during the forecast period. The paints & coatings industry has been expanding significantly due to the shift in demand toward decorative paints. The metalworking fluids sector is also estimated to remain lucrative during the next few years. Inclination toward innovative products and a constant focus on process R&D are factors driving the demand for specialty chemicals including certain additives and softeners. Major multinational companies with high production capacities dominate the global defoamers market. These prominent companies have an advantage due to their presence across the value chain, as compared to other manufacturers of defoamers. Large players are highly integrated, which helps reduce production costs and gain a competitive edge in the market. Key players focus on exclusive agreements, strategic acquisitions, and mergers & joint ventures in order to enhance their market share and serve diverse industries. Usage of defoamers has increased across the globe due to the presence of manufacturers of sophisticated defoamer products and high performance of these products. The report analyzes and forecasts the market for defoamers at the global and regional level. The market has been forecast based on volume (kilo tons) and revenue (US$ Mn) from 2017 to 2025. The study includes drivers and restraints of the global defoamers market. It also covers the impact of these drivers and restraints on the demand for defoamers during the forecast period. The report also highlights opportunities in the defoamers market at the global and regional level. The study includes profiles of major companies operating in the global defoamers market. Key players profiled in the global defoamers market include Kemira Oyj, Wacker Chemie AG (silicon), DuPont, DyStar Group, BASF S.E., Clariant AG, PMC Group, and Solvay S.A. Market players have been profiled in terms of attributes such as company overview, business strategies, recent developments, financial details, etc. The report provides the estimated market size of defoamers for 2016 and forecast for the next nine years. The global size of the defoamers market has been provided in terms of volume and revenue. Market numbers have been estimated based on product, end-user industry, and region. Market size and forecast for each product and end-user industry have been provided in terms of global and regional markets.